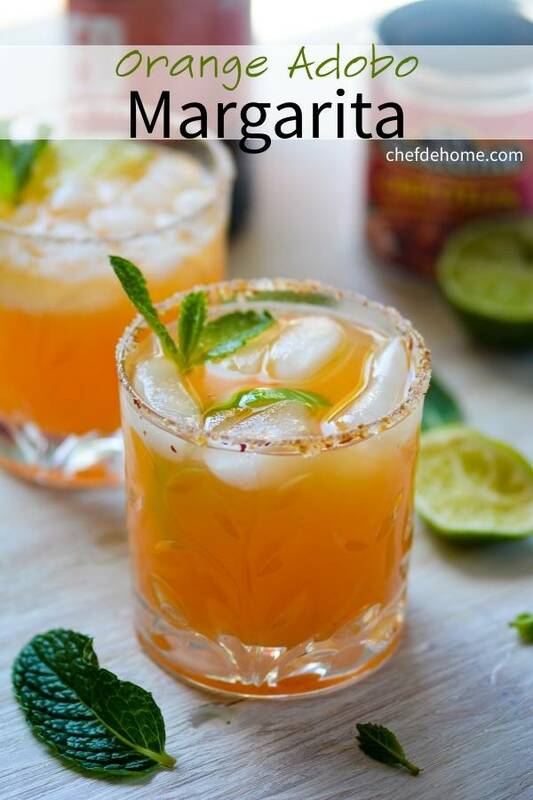 Sharing with you a refreshing orange, agave and tequila Margarita subtle spiced with chipotle adobo sauce. This drink is here for my love of Chipotles in Adobo! I love Mexican spices and chiles and Adobo is one of my dearest. Whenever I want to add some flavor to my Mexican dishes, I always reach for few chipotle chilies or a can of Chipotle en adobo! I'm always looking for inspiration to cook with it! Once such inspiration, I found in California Pizza Kitchen, when I saw Citrus Adobo Margarita on their drink menu. 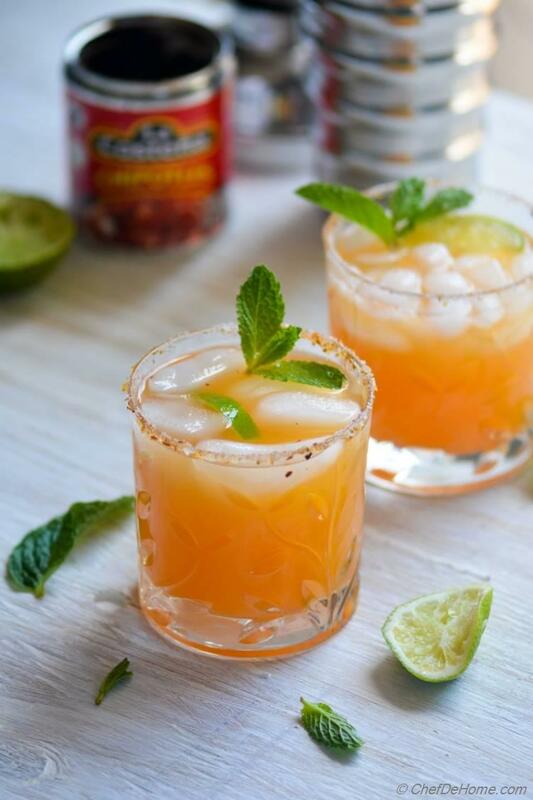 I simply loved the idea of a spiced drink and since then, whenever I open a can of chipotle in adobo, I look forward to serving some Margaritas with it. 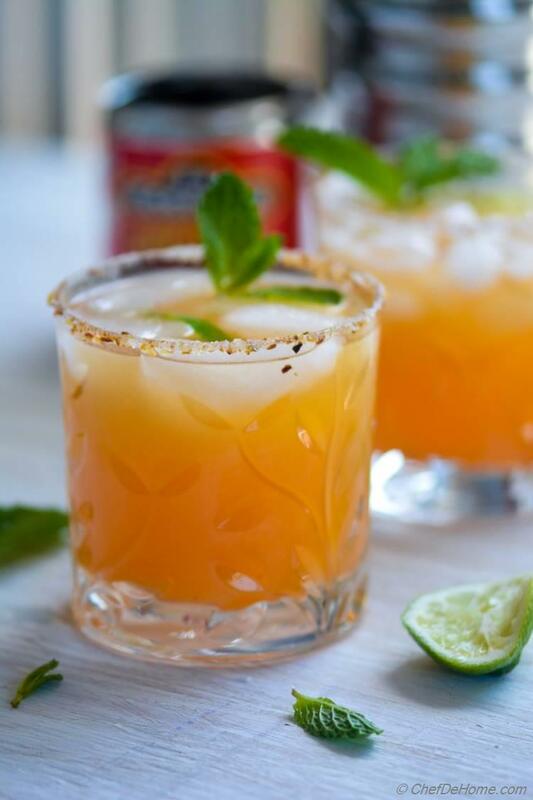 Today's Orange Adobo Margarita is no really a copycat of Citrus Adobo Margarita but is certainly inspired from it. I'm sure you are not surprised with use of chiles in drink. We all love, our very own, Bloody Mary! Don't we? The taste of adobo in this margarita is very subtle. You will only taste a hint of heat at the end of each sip. Almost like a subtle nudge to awaken senses...... like a mild Bloody Mary! 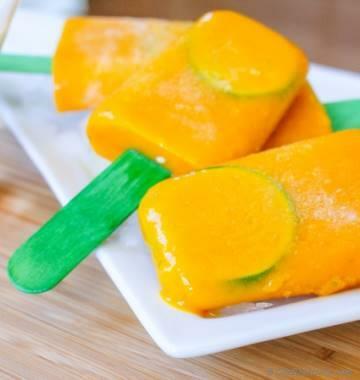 Sounds mouthwatering and refreshing, isn't? Pin it today to surprise your guest this Cinco De Mayo or make a big batch for your next Tex-Mex Party! Friends, my Monday schedule is always very busy and today is no different. I just managed to find sometime to share this recipe with you. Keeping today's past simple and refreshing just like this Orange Adobo Drink! Have a great day and enjoy it responsibly! 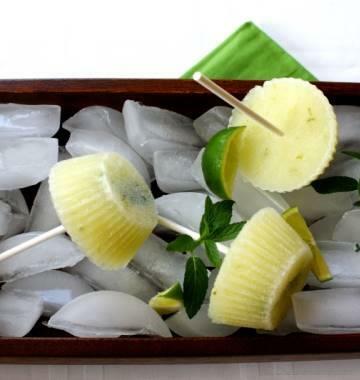 Smart Swap Use pineapple juice instead of tequilla for a mocktail! 1. Spread cocktail salt and chili flakes (if using) in a small flat plate. Rub lime on rim of serving glasses. Turn the glass rim-side down on salt until rim has a lite salt coating. Shake off any loose grains into the sink. Repeat for both glasses and set aside. 2. Combine tequila, agave syrup, adobo, and orange juice over ice in a cocktail shaker. Shake well to mix everything. 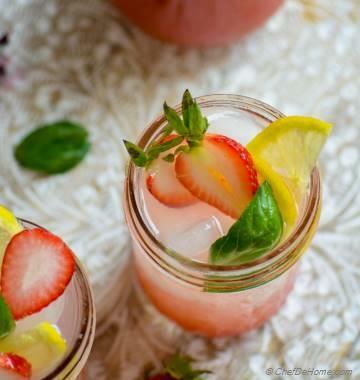 Pour in glasses, add splash of fresh lime juice, garnish with mint (optional), and serve. I love Margarita and I just loved your recipe!! !Awesome!I always fall short of words for your posts! Anu, it is amazing that spice really taste great in drinks! thanks for stopping by my friend! 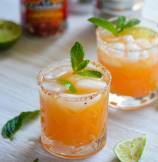 Orange Adobo Margarita looks very refreshing!! Shibi, thanks! Glad you like it. Indeed, this Margarita was very refreshing! Thanks, Jeena! Glad you like it! Shweta, all yours my friend! thanks for stopping by! Indeed, it was very tasty, Gauri! Thanks for stopping by! So tasty! I love spicy drinks as Bloody Mary's are one of my favorites! I can't wait to try this! Annie, thanks! Bloody Mary for everyone! Looks like we all love spicy drinks here :) I'm sure you will love this one too! :) Manali! See, that's why I always say we have similar taste :) We are even inspired from similar restaurants, lol!! Glad you like the drink. Thanks to CPK for the idea, for sure! Such a pretty cocktail, Savita! I know I'll love it as I'm a huge bloody mary fan just because of the spice. I like spice added to drinks. Can't wait to try this! Wow... this sound interesting! I never would've thought to add adobo to a Margarita, but now I need to try this. I looks yummy and love the color. Oriana, thanks, I'm sure you will love this drink.